Champion Sprayon® Flying Insect Killer Formula 2 can be used indoors or outdoors to eliminate annoying flying and several crawling insect pests. It's effective against flying insects such as flies, mosquitoes, gnats and moths. It is also effective against crawling insects such as ants, centipedes, earwigs, mites, cockroaches, sow bugs and spiders. 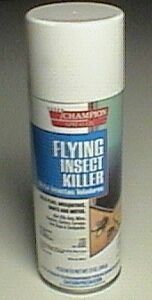 Outdoors, for best results, spray directly on crawling insects. Ideal for: The outside surfaces of buildings, on plants, and as a spot treatment and multi-purpose spray in small gardens. Indoors, as a space spray, and into cracks and crevices, behind sinks, cabinets, along baseboards and floors, over furniture around drains and plumbing lines. I am confused as to which product to get. Our home is and has been attacked by what we think are the noseeums. Actually no one can see them. They come around dusk and dawn and bite only me. Others are not bothered (so far). The attacks are painful, itchy and bothersome. We have tried everything when I came across your website. No one under 10 will be in the home. It is a mobile home with approx. 1600 sq. feet. They seem to be in each and every room. Please advise the best solution for them, also one that has the less strong odor to those coming into the home. We welcome your advice and thank you for responding asap. Noseeums and many other flying pests that bite can have short life spans. In fact for noseeums, its generally just one day. For this reason its hard to use a manually operated spray, fogger or total release "bomb" because they'll just keep hatching. But there is an option that will work. Known as "aerosol machines", these devices are small, easy to use and can be configured to run all the time. The "default" setting is to release a small amount of pyrethrin every 15 minutes. 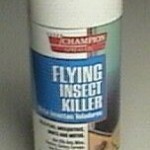 This small amount will kill any flying pest within "range". And the effective range for these machines is about 400 sq/ft. So for your mobile home, you'll need 4 machines. Get the Clear Zone refills, which are odorless and last 30-40 days. Once deployed, all flying pests will be dead within a couple of days and as long as you keep the machines running continuously throughout the warm season for your region, no new problems will be able to develop. This configuration can be deployed safely for use in kitchens, bedrooms and any part of the home. And they can be turned on all the time so all you need to do is keep them filled with a good can and they'll be working around the clock killing any biting pest that comes inside.